Here's a heads up on what EndlessBikeCo. will be doing for Halloween. Check out the Asheville On Bikes Pumpkin Pedaler! Hope to see you there. Here's a sneak peak into my costume. My favorite story book super hero. Sally Jean the Bicycle Queen. Hey, she rides a single speed too! 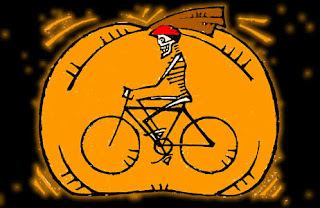 Hope the All Hallow's Eve festivi-tays whent well--love the skeleton on a bike graphic! Very nice All hallow's! almost too good.